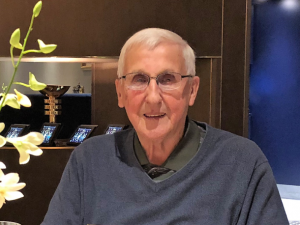 Our father passed away peacefully on March 31, 2019 with family by his side. Dad was born October 18, 1934 at the Grey Nuns Hospital in Regina to Vern and Muriel (Benrud) Hunter. He spent his earlier years on the family farm near Hawarden before moving to Hanley. Their farm was known as Hunter’s Corner, a place where neighbours gathered to have a haircut and catch up on the local news. He joined the Cubs, Scouts, was confirmed in the Hanley Lutheran Church and excelled in small town sports. During his high school years, he took summer jobs including 3 seasons with the Dept. of Highways. In 1951 he met the love of his life, “Murn” (Muriel Kermeen). They were married on December 11, 1954. Dad was always interested in the great outdoors and so applied to the first Conservation Officer training school in Prince Albert, graduating in 1953. His first posting was Uranium City, a new and bustling mining town. This was the beginning of a rich and exciting career. Caribou, dog sleds, bush planes, barges, ice roads, bombardiers were all new experiences for a prairie boy. Every trip made with a bombardier was an adrenalin rush as ice thickness and currents were constantly changing. Department staff played many roles in the north: checking commercial fishing operations, trapper activity, search and rescue, emergency trips to the outpost hospitals for the nurses with patients, monitoring timber operations, forest fire suppression, first responders, accommodating travel for many which was treacherous at times, to name just a few. Dad then had several transfers: Buffalo Narrows, Sandy Bay, Cumberland House. Cumberland was a community he had many fond memories of including organizing a men’s indigenous hockey team that played in The Pas, Carrot River, White Fox – all travels made by bombardier. The many bombardier trips for his work, the DNR radios limiting communication, and the close calls that he survived, including flying his own plane for years, made for some exciting storytelling, a gift he had mastered. Our family moved many times during Dad’s career – starting out as a Conservation Officer, Park Superintendent, and finally as Director of Northern Field Services,” the best job in the world”. All of his postings were a challenge but being Superintendent at Duck Mt. (Madge Lake) Prov. Park was one of his favorites. It was a popular beautiful Park with a wide variety of wildlife including bears. The work he loved enriched the lives of his family and taught his children many of life lessons. Dad’s retirement hobbies were being involved in four small businesses – one with his wife called “The Trophy World” in Moose Jaw. Dad was always there for his family and his friends and for strangers. 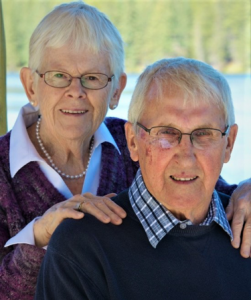 He loved life and lived it to his fullest enjoying golfing and curling in his spare time. He was a selfless human being that even in his last few days, his biggest concern was that the love of his life was well cared for and that his family continue the bonding they enjoy today. This wonderful father, husband, Grandpa and friend is on his last field trip – no need to pack a lunch “Murn”. Dad was predeceased by his parents Vern and Muriel , sister Wynnie Anderson and brother Jim, brother-in-law Jim Kermeen, sisters-in-law Enid Schafer and Margaret Fitzgerald, Dad is being ushered into his next life by his wife of 64 years Muriel, son Bill (Pauline), daughter Deb (John), daughter Kim (Leigh), son Ken (Lora), his grandchildren Derek, Adam (Desiree), Ryan (Vida), Kirsten, Jennifer (Bobby), Linsi (Jordon), Matt, Kate, Jocelyn, Casie, Chelsey (Carson), Garrett (Lori), Coty, Tanner and Cade, great grandchildren Elise, Lincoln, Isabelle, Sophie, Caden, Lorne and Sam, sister Leone Bohrson, brother Robert (Vale), sisters-in-law Valborg and Pat. In lieu of flowers, donations to the Hanley Lutheran Church or SPCA would be welcomed. Many thanks to the Saskatoon Palliative Home Care and St. Paul’s Palliative Care Unit for their support. Crematory services are entrusted to Cherished Memories of Martensville Sk. (306-242-7888) with a private ceremony to be held at a later date. It is with great sorrow that I red this, but I can’t help but think of the wonderful memories I have of working with Dennis. I was a young upstart and he took me under hid wing and gave me sage guidance. He allowed me to try and even fail, but was always supportive and reassuring. He gave me a great start to a very rewarding career, and this I will always be grateful for… rest in peace my friend and thank you for giving us all your time and consideration….